Why won't my tapestry design work!? I've designed an emblem based on something from World of Warcraft (geek alert! ), I've put it onto the Flat Pattern graph paper Carol Ventura kindly has on Ravelry for free. Its all on there but when I come to stitch it, it is still out of place and doesn't match up. I know that when working on patterns for flat work, the stitches slant right-left-right-left as you go up on the rows and I thought I understood that when making the graph but I was obviously wrong. Anyone able to trouble shoot this for me? I can attach my graph as a PDF if anyone needs to have a look. What stitch are you using? Are you stitching onto plastic canvas? a cloth? crocheting? I've created charts for afghans using half double crochet because it is the squarest stitch - it doesn't distort the pattern. Its crochet and I'm using single stitch. I'm familiar with the technique. Are you keeping the right side of the piece facing you at all times? Keeping the right side facing, reverse single crochet your way back over to the other side of your flat piece. Be sure that you read the graph from Left to Right as you work this round. The other way is the "switch hands method." Here's how you do it: Keeping the right side facing you, switch the hook into your non-dominant hand (I'm right handed so I do this row using my left hand) and work your way across to the other side of your flat piece being sure that you are following the graph in the correct direction. First of all, a WoW tapestry is AWESOME! Second, I'm currently working on my first tapestry and was having the same problem. Funny enough, the current issue of Crochet Today (Nov/Dec 2011) has an article about how to make your color changes without it becoming all slanty and not matching up. It's all in the loop you're using to make your color change. I'm using white and need to start my design with red. Instead of inserting the hook and yarning over with red to change colors, insert hook, YO with white, pull through then YO with the red. 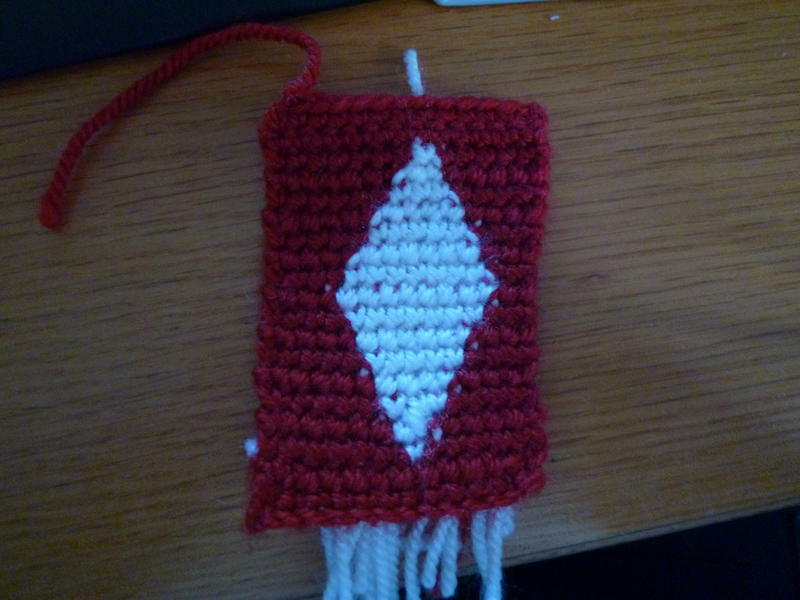 This will give you a finished white stitch and have your red ready to start the design without getting those half white/half red looking stitches! Does that make sense? This totally saved my tapestry! I don't think its an issue with the actual stitch, I've been able to do the colour changes successfully. Its more to do with how the graph shows a row compared to actually stitich it. 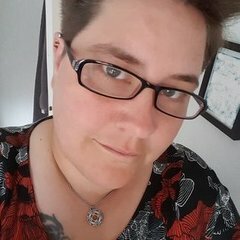 @JustAddGlitter - Its an Alliance-esque banner. I'm trying to make a "bits" bag for one of my guildies whos an artist. I've tried both methods and I've found that if you choose the reverse single crochet method, your image will be slightly taller. Ooo... thank you. That would be a great. Thanks for you help TheKnottyMale. I included directional arrows to help keep you on track. 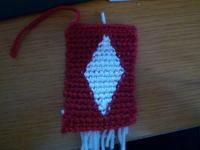 I also made a second graph that shows the same diamond made on flat tapestry crochet paper. It's MUCH MUCH easier to follow the square-ruled graph! I made a slight mistake with the typed instructions I posted above. If you are going to use the REVERSE SINGLE CROCHET method, you turn the piece over, but be sure that you are reading the graph in the right direction. Didn't realize I messed up the instructions until I read the post again today. The other part of the post is right though... if you use this method, your image will turn out taller. Thank you. I shall give it a go and post the results. Are you sure that you are matching up the same rows that slant to the left and then to the right with those rows on the graph? Does the face of the fabric only show the front of the stitches (not every other row)? Ok... thanks TheKnottyMale for your little graph. Here's how it turned out. I tried both techniques you mentioned but found Reverse Sc the way to go for me. I'm pleased with how the diamond works out. So, thats working on a flat surface... is it poss to tapestry crochet in a round? I.e. a hat. Here's a tapestry crocheted cap. I've made at least 20 of these over the years! To keep the cost inexpensive, I used double stranded RHSS of each color - besides.... I can't play with wool. It destroys my hands. P.S. I don't understand why you have all of those blue tails hanging. There should be nothing hanging at all. The unused color is continuously carried - not clipped and woven in. Crocheting in the round is much MUCH easier! Check out the other free patterns that Carol has available. They are great projects for beginners. I've mentioned this in other posts, but I'm espcially fond of the Kitty Bag pattern. It was my first one. I recently took that motif and turned it into a Halloween Tote that I recently gave away here at Crochetville. I didn't even notice that you had posted earlier. So glad to see that you check things out at Crochetville. I know how busy your schedule is! I received an "update" email about your post, so I had to take a look! Thanks for all of your posts!